For decades, doctors have been perplexed by the unexplained, sudden deaths of seemingly healthy babies, often while they are sleeping. Known as sudden infant death syndrome, or SIDS, the phenomenon, while rare, is the leading cause of infant death in high-income countries. 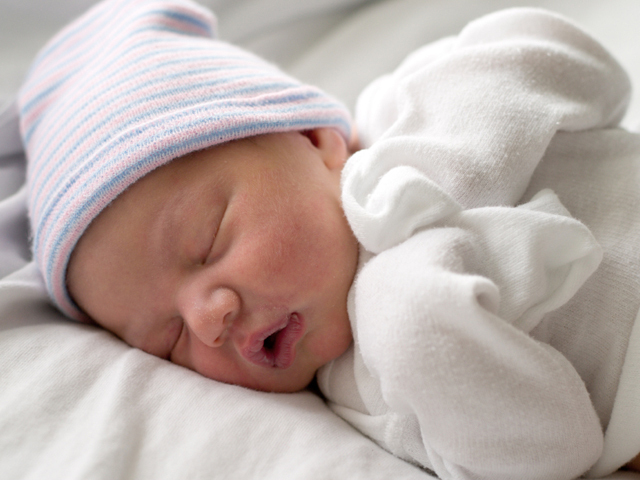 While the cause of SIDS is not known, certain factors appear to increase the risk, including the position and environment in which a baby sleeps. A campaign to educate parents about putting babies to sleep on their backs has helped reduce SIDS deaths over the last two decades, but the fundamental mystery remains. Now, new research suggests a potential genetic mutation may play a role in some cases. The study, published in The Lancet, found rare mutations associated with impairment of the breathing muscles were more common in babies who had died from SIDS than in healthy infants. Study author Prof. Michael Hanna, of University College London and the National Hospital for Neurology and Neurosurgery in the U.K., says the findings might one day mean babies could be tested for these mutations and, if they are found to be at risk, potentially given a drug treatment that could lower their risk of SIDS. "However, I stress this needs further research before we know if this would help," he told CBS News. No such drug treatment has yet been developed. According to the U.S. Centers for Disease Control and Prevention, about 3,500 babies in the United States die from sudden unexpected infant death (SUID) each year. SUID is a newer term used to describe the sudden and unexpected death of a baby less than 1 year old and includes deaths from SIDS, as well as accidental suffocation in a sleeping environment and other deaths from unknown causes. Starting in the 1990s, the American Academy of Pediatrics issued the recommendation that babies sleep on their backs, with the thinking that babies sleeping on the stomach or side might have more difficulty breathing. Following the 1994 "Back to Sleep" campaign, rates of SIDS decreased sharply. But researchers say one infant death is too many and across the globe, scientists are working to unravel all potential causes. Previous research suggests abnormalities and defects in parts of the brain that control breathing and arousal from sleep may also play a role, but further studies are needed. The new Lancet study analyzed the genes of 278 children who had died from SIDS and compared them to genes of 729 adults who had no history of cardiovascular, respiratory or neurological disease. The researchers looked specifically at mutations in the SCN4A gene, which are associated with impairment of the breathing muscles. Typically, these mutations are very rare. They were found in four of the 278 children who had died of SIDS, compared to none of the healthy adults. Since the study focused on a group of white European children, further research would be needed to see if findings are similar in other ethnic and racial groups. Hanna notes this is the first study to link a genetic cause of weaker breathing muscles to sudden infant death syndrome and says the findings suggest that genes controlling breathing muscle function could be important to the disorder. In an accompanying editorial, Dr. Stephen Cannon of UCLA writes that "overall, the evidence is compelling that variants of SCN4A with disruption of channel function are overrepresented in SIDS." However, experts emphasize that the research is still preliminary and does not explain the majority of such deaths. They urge parents to continue to follow the long-standing advice to help protect babies from SIDS. "Putting babies to sleep on their backs remains the most important advice along with avoiding co-sleeping and cigarette smoke," Hanna said. "This research is starting to unravel genetic risk factors but further research is needed to assess relevance to clinical practice." Avoid use of soft bedding, including crib bumpers, blankets, pillows and soft toys, which could pose a risk of suffocation. Babies should share a bedroom with parents, but not the same bed, at least for the first six months and preferably the first year. Room-sharing decreases the risk of SIDS by as much as 50 percent.